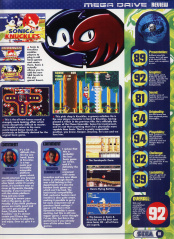 Review - Sonic & Knuckles is a two-page review of Sonic & Knuckles in a 1994 issue of Sega Magazine. 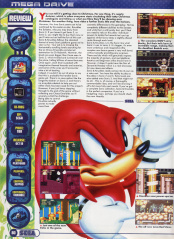 The reviewers give it a 89 for "Presentation", 92 for "Graphics", 81 for "Sound", 34 for "Originality", 94 for "Playability", 82 for "Challenge", 89 for "Lastability", and a 92 for the Overall Score. This page was last edited on 28 March 2012, at 22:50.